Two people who pride themselves on being punctual, Karan Johar and Anupama Chopra, are running late for their discussion panel at the London School of Economics SU India Forum. It’s not a starry late entrance though – they simply didn’t know that one never makes plans in London without checking the number of obstacles the city will inevitably throw your way when you’re in a rush. On this lovely, sunny Saturday, an entire section of the London Tube has been closed for repairs and two separate, giant protests (one against the Trump state visit and the other against the systematic gutting of the NHS) have blocked traffic in all sorts of interesting ways. Johar finally makes it in about 15 minutes late, having taken a cab from Mayfair like a total noob; Chopra got as far as Trafalgar Square before the massive crowds persuaded her to just hoof it. Johar, mindful of the plane he needs to catch later in the evening, uses the 20 minutes before she arrives to field questions from the room. The LIF is a yearly event but this is the first time they’ve held a pre-LIF discussion and one suspects it was because they had to accommodate Johar’s packed schedule. He is clearly a speaker that draws a crowd – 200 students bought out the tickets in nine minutes flat and quite a few older guests have inveigled an invite as well. In person, he is exactly as you have seen him on TV: average build, medium height, familiar smirk. I’m struck by his shoes because a) I’m so used to seeing him midshot on TV, I don’t remember having seen his feet before; and b) they’re a violent shade of neon silver sneakers that I’m sure are the pinnacle of some mysterious men’s fashion that is more attractive to men than women. The crowd is entirely desi (I spied one white photographer) and the young women in the audience are all dolled up and ready for their shot: perfect makeup and long, straight hair, chic dresses that are entirely too flimsy for the weather. The young men are no less, clean cut and leaning intently forward as Johar speaks, nodding along to his bon mots and catty zingers alike, some sporting those high collared Nehru vests that are the last word in rising-Indian-politician chic. He says hello to someone’s mom, professes his love for La La Land and Ranbir Kapoor, announces that Bombay Talkies 2 is in the works (Zoya Akhtar has already finished filming her segment while he is yet to begin scripting his) and speaks of Dharma’s evolving digital plans. One of the first questions is from a Pakistani fan who wants to know if Johar will ever take a chance on a Pakistani actor again; he is witty and diplomatic as he deflects her with protestations of his own helpless progressivism and effusive praise of Fawad Khan’s talent. Another young woman wants to know his take on Saif Ali Khan’s homophobic witticisms on this season’s Koffee with Karan; a nervous Nehru-vest-clad student organizer pipes up thinly that personal questions are discouraged. “Was that personal?” Johar winks broadly at the roaring audience before choosing to answer by affirming Khan’s liberalism in his personal life. Once Anupama Chopra arrives, they’re immediately off; the comfort of long familiarity evident by how easily they’re able to launch straight into deeply personal subjects. 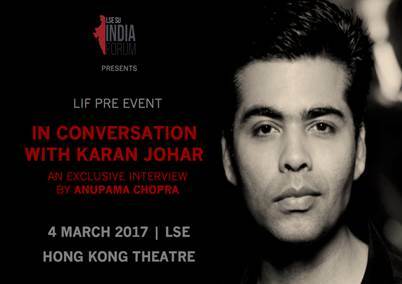 The talk is as wide ranging as any Karan Johar event based on the always fascinating subject of himself that you might have witnessed before, with Chopra referencing a chapter in Johar’s recent memoir, An Unsuitable Boy, where his mother ticks him off for being mediocre in every respect and how that went on to fuel his discovery of himself as the celebrity we recognize today. He is candid about only attending award shows that pay him to emcee, his fear of eventual and inevitable irrelevance, his love of Hindi film music, that entire scenes of Ae Dil Hai Mushkil have been adapted straight from his failed romances, and his desire to make a film that Chopra will love. Things then took a turn: Chopra introduced a segment on pay parity in Hindi cinema, pointing out that while she understands the pay scale being pegged to a star’s ability to attract an audience, even newcomers are paid different rates according to gender. Johar immediately distances himself from such practices. Chopra reminds him of Sonam Kapoor’s recent statement that her upcoming project with Kareena Kapoor, Veere di Wedding, was unable to generate a fraction of the funding given to a Varun Dhawan and John Abraham project. “Because Varun Dhawan is a bigger movie star,” Johar said, flatly matter-of-fact. Next came the controversial segment where Johar defended himself from Kangana Ranawat’s accusation on a recent episode of Koffee with Karan that he is the “flag bearer of nepotism” and part of the “movie mafia” that made her early years in the Mumbai film industry a nightmare. “I just want to say, I’m glad she knows what it all means,” he began, a perfect (and perhaps unintended) callback to Ranawat’s point that Johar was one of those who mocked her relentlessly for her poor English when she first arrived in Mumbai. The crowd erupted in raucous cheers that turned variously into gasps and applause as he went on to list the number of directors with no prior industry links who have been employed by Dharma. Even if Ranawat was talking about actors, he said, the only two industry kids he has given a break to are Alia and Varun, neither of whom are related to him. As for being a member of the so-called movie mafia that excluded her, he said he couldn’t understand the charge – although he considers her to be an outstanding artist who is fully deserving of praise, when it comes to making his films, he felt entitled to his choice of cast. Later, as the evening came to a close, I overheard a couple seated behind me discussing how much they’d enjoyed the evening and Johar’s frankness. I came home and began to write this article, Googling to see if anyone had uploaded video of the event – and the very first link was the surprise announcement of Johar’s brand new fatherhood via surrogacy. The man had sat five feet from me at an event to discuss himself, interviewed by a woman who plainly felt no qualms asking him sensitive questions, and there hadn’t been so much as a hint of any such thing in the offing. In fact, it apparently came as a surprise to most of his acquaintance who’d attended a well-publicized singles party for Valentine’s Day at his home a mere seven days after his children were born. In hindsight, therefore, the entire event became a whole other exercise in studying how celebrities hide in plain sight and retain the ability to practice discretion when warranted, even in the media-saturated environment of 2017. Celebrity events are a dime a dozen but it is always a pleasure to attend a master class. You can find more of her work on her blog or follow her on twitter! LIF is the first of its kind forum in the UK involving keynote speeches and panel discussions on major economic, political and cultural issues facing contemporary India. The conference serves as a platform for students and young professionals alike to engage with some of India’s leading industrialists, politicians, economists and popular culture icons. LIF – Saturday, 11th March: India – A Superpower in the Making?